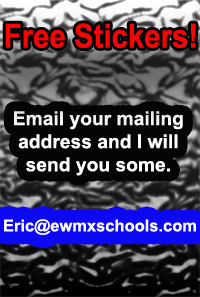 EWMXSchools.com - The Northwest's Finest Motocross Training Classes! EW MX Schools kids Moto-Camp, Bothell Wa. The camp is limited entry. Pre-signup only. Class will start at 10am and run till 4pm. If parents need to bring riders earlier or pick up kids later, they can bring riders anytime after 9am and pick up riders before 5pm. To sign up; fill out the entry form (CLICK HERE) and mail it to the following address with the entry fee. © Copyright 2009-2010, EWMXSchools.com. All rights reserved.